It was all smiles on Sunday night. Published April 15, 2019 at 10:06 a.m. The Pistons looked like they could use an oil change after the Milwaukee Bucks demolished Detroit, 121-86. 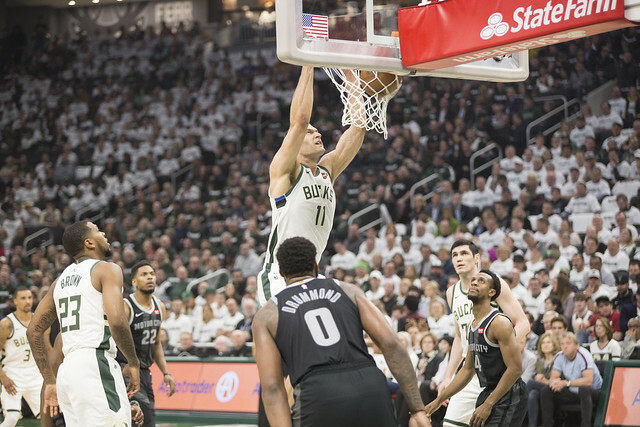 Led by the Greek Freak, who scored 24 points in just 23 minutes, the Bucks won Game 1 of the opening series against the Blake Griffin-less Pistons in impressive fashion. Although Detroit visibly struggled from Griffin's absence, the outcome wouldn't have mattered with the way the Bucks shot and controlled the game. From top to bottom, every Milwaukee player contributed to the W and built a great amount of momentum going into Wednesday's Game 2 matchup. A little bit of snow wasn't going to spoil fans on Milwaukee Day, especially when the local holiday landed on the same day as the first ever playoff game at Fiserv Forum. The Bucks hit the ground running and made a statement from the opening minutes until the end of the fourth quarter. With a 121-86 win, the Bucks' 35-point margin is the team's third largest playoff margin of victory in franchise history. You don't win a game by nearly 40 points without a little help on the offensive end. Milwaukee was red hot throughout the game but especially in the first half. The Bucks scored 70 points in the first two quarters alone, which is the second most in Bucks playoff history. Detroit had no answers for the Bucks' offensive production in Game 1, as they haven't all season long. Over 17,000 fans filled the Fiserv Forum on Sunday evening, and as an added bonus, they were gifted with a free white or green "Built To Stay" T-shirt to rep their favorite team. A total of 17,529 fans were in attendance, including several fans who purchased Standing Room Only tickets just to get through the doors and keep the arena loud and rumbling. With a good three-point field goal percentage (34.9%) and 52 points in the paint, Milwaukee boasted a great 48.9 field goal percentage for the night. 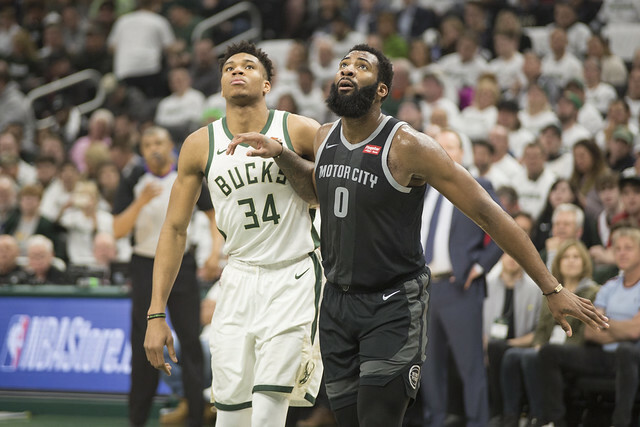 Nearly half of their shots hit the bottom of the net, and the Bucks were able to destroy the Pistons and keep their division rivals at a healthy distance the entire game. 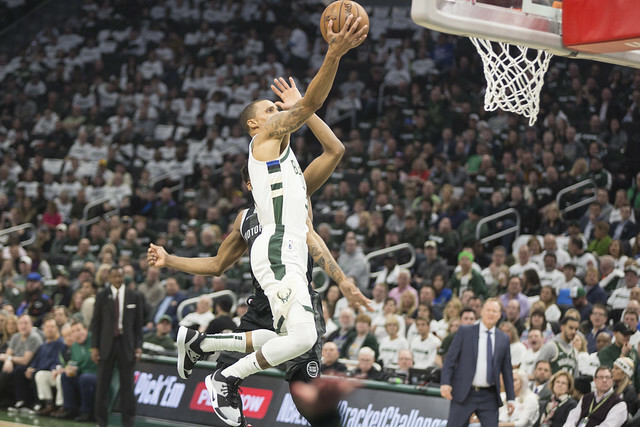 While you can't expect the Bucks to shoot over 48 percent in every playoff game, Sunday was definitely a great night for the team. Although Milwaukee is led by your league's next MVP, Sunday night's big win was definitely a team effort. A total of seven Bucks players scored in double digits during Game 1, including all five starters as well as George Hill and Pat Connaughton. 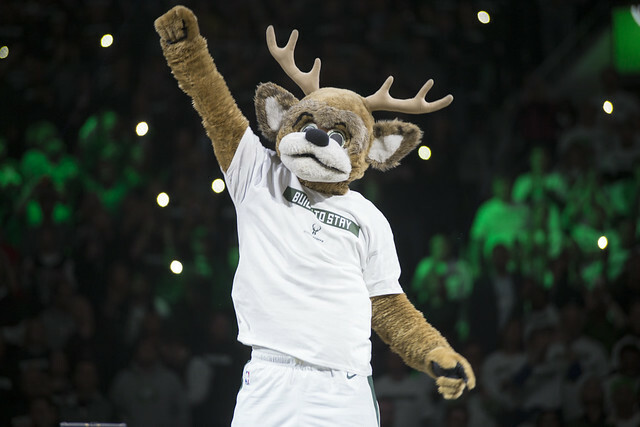 With the exception of just two players off the bench, every Bucks player on Sunday either scored double digits or had an over 50 shooting percentage. Twenty of the Bucks' 70 first half points came just a few minutes into the game as Milwaukee started their playoff journey with a 20-to-4 run against Detroit. By dishing up such a huge blow in confidence to the Motor City, Detroit wasn't able to inch back to erase the early deficit – and matters only got worse for them. Adding to his 24 points, which led all scorers on Sunday, the Greek Freak was a monster on the boards. Giannis totaled 17 rebounds throughout the game in only 23 minutes. Sunday was another reminder why Giannis isn't only the league's most valuable player but also that he is arguably the league's best defensive player as well. Sterling Brown definitely did his part in Game 1 by leading all passers with seven assists for the night. No single player dominated the ball on Sunday, so to total seven assists with no turnovers – and as a shooting guard – was definitely a huge contribution to the Bucks' win. 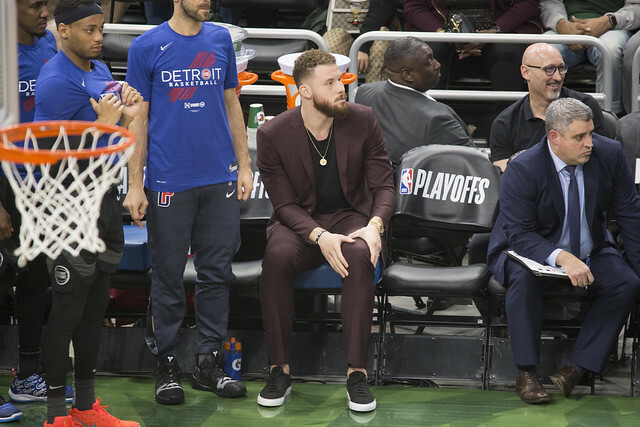 Although it doesn't look like it would have mattered, the Pistons certainly didn't get any better with their best player, Blake Griffin, scratched from the lineup. Griffin sat during the series opener with a left knee injury and watched his team suffer from the bench. Despite not playing, Griffin did find his way onto the stat sheet after he was assessed a technical foul for protesting teammate Andre Drummond's ejection from the game for shoving Giannis in the third quarter. It's unclear whether Griffin will suit up for Game 2. Replacing Blake Griffin in the lineup, former Milwaukee Buck Thon Maker got the start for Detroit. Maker didn't react well to the boos aimed his way from the sold-out arena and scored only four points on 10 attempts. Maker also struggled to guard his former teammate, as Giannis had a great night scoring despite Maker's hard fouls and 7'1" frame. Taking things one series at a time, the Bucks now need just three more wins to advance to the second round of the playoffs. Milwaukee hasn't won a playoff series since the Ray Allen days, so to be just three wins away from that relative milestone seems like a blessing. If Game 1 and the regular season was any indication of how the rest of the series will play out for Milwaukee, this may be a very quick series. Of course the Bucks and their fans have much higher expectations than a single playoff series win. As it stands, 15 is the number that Bucks fans have on their mind as Milwaukee needs 15 more wins until the team can hoist the Larry O'Brien trophy. 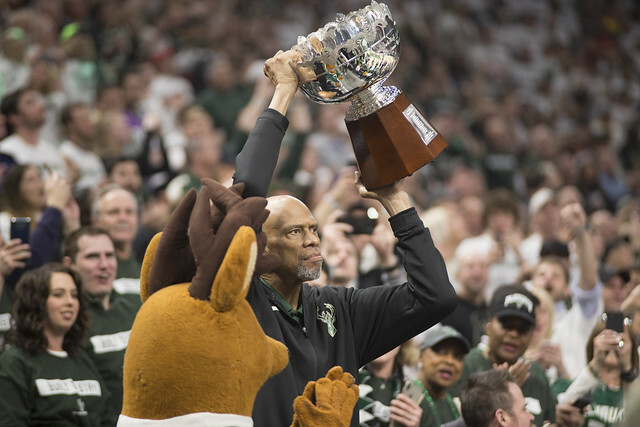 A good sign for such a goal came during Game 1 as NBA legend Kareem Abdul-Jabbar greeted the crowd while raising the Milwaukee Bucks' championship trophy from their historic 1971 season. Will Giannis follow in his footsteps?